Habitat Build Days are an important fundraising component in support of our mandate of providing affordable homeownership to our community. A Habitat Build Team has the unique opportunity to spend a day assisting in building one of our Habitat houses. 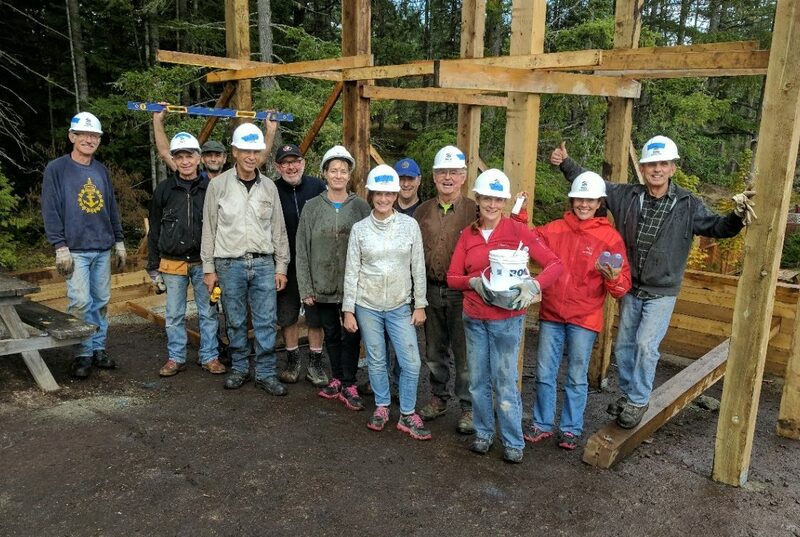 Team builds are often done by local businesses, corporations or even a group of friends wanting to have the experience of working on a Habitat build site. This opportunity not only helps build a Habitat home, but fosters team morale, and creates a sense of community and team spirit! Habitat Build Days consist of tasks on our local build sites – from framing and site clean-up, to painting, landscaping and much, much more! You and your team can look forward to an exhilarating, action-packed day on our local build site. Here’s what a typical day looks like. 8:30 am: Participants arrive at the site and sign in. You’ll be outfitted with personal safety gear and you can grab your morning coffee and light breakfast. 8:45 am: Welcome and safety briefing. This is when you’ll either be assigned – or possibly get to choose your task for the day. 12:30 pm: Lunchtime! There is a catered lunch included with your build day and snacks, coffee and water will be available throughout the day. There is also a small refrigerator on site for anyone who wishes to bring their own lunch. 4:00 pm: Clean-up and farewell. For more information on how your company, organization or individual group can get involved in a Habitat Build Day, email us at info@habitatmvi.org for more information. 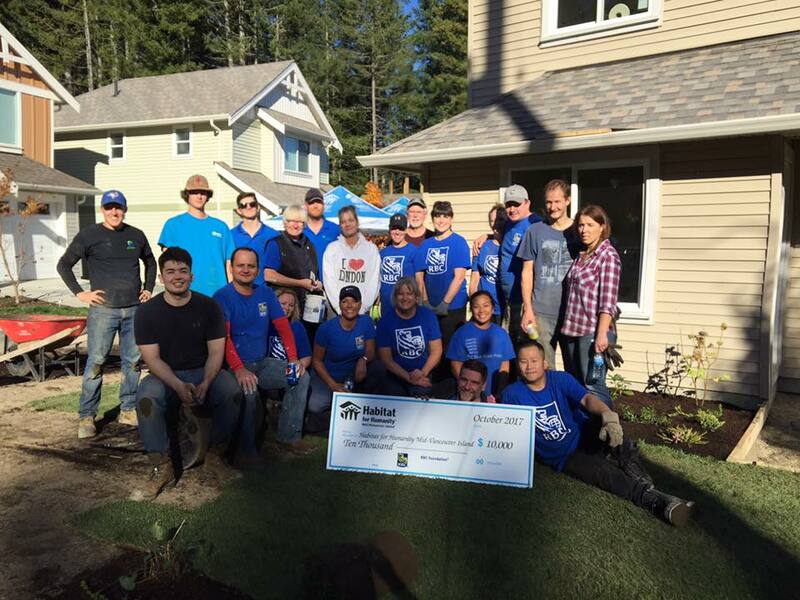 On October 24th, after many days of rain, the sun shone brightly for more than a dozen RBC staff participating in a Habitat Landscape Build day. With wheel barrels, shovels and rakes in hand, RBC staff levelled Unit 5 and 6 yards, planted trees, shrubs and perennials, and laid sod. The painting of Unit 5 and 6 exterior trim was also completed by some of the staff. In addition to all of the hard work by RBC staff throughout the day, RBC Foundation donated $10,000 towards the Landscape Build day. Thank you to everyone for your enthusiasm and efforts. You did an amazing job! A special thank you to Terminal Park Starbucks who has been donating coffee for all of our Build days, Chase River Country Grocer who donated beverages, fruit, veggies and snacks, and Panago Pizza (North end Nanaimo) who donated lunch for all of the volunteers! Thank you for your support! On September 30th, members of the Rotary Club of Lantzville donated $5,000 and participated in a Habitat Build day at our Meadow Hill Development. Rotary Club members, their families and friends were on the build site helping to construct the children’s playground, site cleaning and preparing a garage for a concrete floor. Many of the Rotary Club members also volunteered at our build site during the Carter Work Project in July. Thank you to all the members for taking on difficult tasks and being so productive while having FUN. 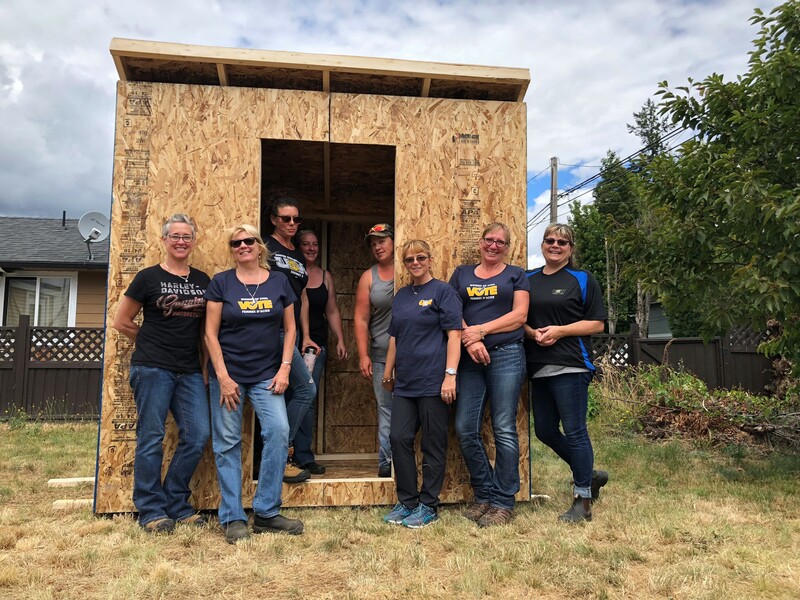 Habitat Mid-Vancouver Islands first ever all female build day took place in July 2018 when the United Steelworkers “Women of Steel’ local union 1-1937 spent a day in the Cowichan Valley sharpening their construction skills. The group put their brains and muscles to work constructing and painting sheds that will be used at our Cowichan Lake Road Duplex in the future. The sheds were also used on our float at the Cowichan Valley parade. The group also held a very successful Beer and Burger event which raised close to $3,000for Habitat for Humanity. A big thank you to all the ladies involved from all of us at Habitat Mid-Vancouver Island.